Ess: And we’re back! Welcome to the very fourth issue of Running on Italics, stimhack.com’s flavour review column! Cee: This week, we’re heading back to Breaker Bay as corporations, seeking to nab up as many impressionable students as possible! Ess: Apologies for the delay this time around, folks, but we happened to have Regionals in between. I made a fairly respectable showing, at tenth. How did you do, Cee? Cee: No. Also? We’ll talk when you can beat my Making News deck. Cee: It’s an agenda. Agendas really don’t seem to need much explanation, do they? Ess: The domino effect mechanic isn’t immediately obvious, I guess, but I suppose it’s just that you as a corporation are meant to be funding fairly similar projects to begin with. Cee: Or you’re likely to be, anyway. So, when the lab at the local university that you threw money at hits a big breakthrough, your other researchers can capitalise on the result? Ess: Sure, why not. I think a major reason why I’m being so easy on the card is Mr. Scrunchy Face on the art. Behold, the expression of progress! Cee: Working on brains is hard, Ess. Pray you never have to. Ess: And I know I bang on about the underlying cynicism of cards fairly often, but here it’s just there, on the surface. Cee: It’s somehow incredibly sad that the some of the most obviously impure motives we’ve seen yet come from scientists. You’d expect—you’d hope—science would be better than that, but it’s just not, and that’s an optimism that the world of ANR just has no time for. Ess: Well, this is corporate-funded research. Haas does a lot of that; we know The Professor was a Haas researcher. In fact, that’s how he got blacklisted, didn’t he? Cee: Yep. I present to you, press release flavour text! Ess: It’s interesting how none of the other corps have their fingers into academia this publicly. Jinteki, especially, seem like they keep their researchers in-house, but we haven’t heard anything from NBN or Weyland about their pursuit of knowledge. Cee: It makes sense, right? Weyland and NBN don’t need to be on the cutting edge of research; they just need to exploit key darknesses in the human condition we already know about. Better, of course. Cee: Anyway, Research Grant is, again, a clean and simple agenda. B+? Cee: I’d like to think we all consider Turing a personal hero. But yes, thematically, building a Turing Test into the ice is gorgeous. Great flavour. Ess: Well, presumably it’s not a Turing Test specifically; Swordsman tells us that those are easy to break these days. But an homage, sure. Cee: It’s unfortunate that the other Pioneer Ice aren’t anywhere near as flavourful, though. They’re all fairly generic in-faction effects tied to a server chosen basically at random. Crick makes some sense on Archives, at least, but I can’t see why NBN would get the R&D one, or Weyland the HQ one. Cee: The art is fantastic, yes. I really like the use of this abstract art style on cards that don’t have an obvious physical analogy; it’s a convenient way to build character and contextualise the card. But what’s up with the flavour text? Meru Mati aside, I’d have expected the Pioneers to be universally known by now, at least to ANR’s audience. I mean, the flavour almost reads like excerpts from a textbook! Ess: …from a textbook? Are these ice all in a textbook? Is this part of the Gore School of Network Architecture’s syllabus? Christ, were these ice written as teaching tools? Cee: That possibly explains the strange server-specific strength bonus—a quick and hacky way to build high strength ice for students to have a look at, while not giving away the actual trade secrets involved. Ess: That would also explain the naming! It’s exactly this kind of goodwill project, licensed free of charge from your friendly local megacorp, that you’d expect to see named after a Pioneer. Ess: You could probably flail your hands wildly in the direction of lack of anonymity and how it relates to better access to information? Cee: I don’t know if I’m buying it. Ess: Luckily, you don’t have to! These ice have already made their return on investment, in training the next generation of cybersec administrators! Cee: Mmhmm. This set came really close, but cigars are not forthcoming. An A- for Turing I think, but B’s for the rest. Ess: I’m gonna give Gutenberg a C, but otherwise that sounds fine. Cee: Reference to Star Trek, or actual algorithm? Ess: Whichever it is, his script can do it in an eighth of a second, Cee. An eighth! That must be one impressive script. Cee: I highly appreciate the reference, either way. Though… he doesn’t look enough like Kirk. And, as now is the correct time to mention, this is the other half of the scene on Career Fair! Ess: I love when cards make little references to each other like that ^_^ Also, can I just point out how adorably bright eyed and bushy tailed these kids are? Interns was my favourite card for a pretty long time, just on the strength of its art! Cee: So the implication here is that as a runner playing Career Fair, you do an internship with Jinteki, and you get paid in kind. The sysop being tutored up probably isn’t actually Midori, just someone who admires her and uses her admin style. Ess: Or it could be a mentor/protégé relationship; the bright young prodigy you recruit attracting one of your old guard to the front lines. And—it seems obvious, but I should mention—Recruiting Trip is actually a Jinteki card, as the art on Career Fair would require! Cee: What is weird to me, though, is that a lot of the cards we think of as sysops aren’t actually typed Sysop. Nothing about this flavour seems to preclude tutoring up Ash, or Caprice. Ess: There’s a reason the Smith & Wesson has to mention all four subtypes, Executive, Sysop, Bioroid, and Clone, yeah? And the reason is that FFG is super inconsistent with subtyping. This conversation has been had before, and will be had again, but it continues to be just as true as it always was. Cee: Wait, Bank Job and Easy Mark are Jobs, but Day Job isn’t? And if we’re going to stick with that theming, why isn’t Liberated Account? Wat. Ess: I somewhat suspect this was one of the reasons behind the decision to implement rotation, actually. I’m not saying it was a major reason, but surely they have to look back at some of these inconsistently designed cards and not want to have them be forever in the game. The straw that broke the camel’s back? Cee: Coming back to Recruiting Trip, I can see why it specifically wouldn’t target Executives, but it seems like it should be able to target Ash and Caprice. However, it can’t do that without also targeting Alix and Tenma Line, is the problem. Cee: That’s true! So maybe the subtyping glitch happens to work out here, sysop representing those whose knowledge is transferable and fits into a standardised format. I’m happy then to give the card a solid B, but FFG still really needs to fix this subtyping issue more generally. Ess: …should we get the good things out of the way first? Ess: …you’re going to make me do this, aren’t you. Ess: I guess I like the bioroid security guard on the art? He looks exactly like the classic stereotype of a bouncer, which is exactly what they would have designed him to look like. Cee: Loses marks for no power suit. Ess: The flavour text is sweet, too. For zero creds, NBN implementing a global “blacklist” into public events and career opportunities is deliciously evil. Using that to strike back at a pesky runner who’s been nipping at their heels is just so them. Cee: Loses marks for not having some sort of a tag requirement. 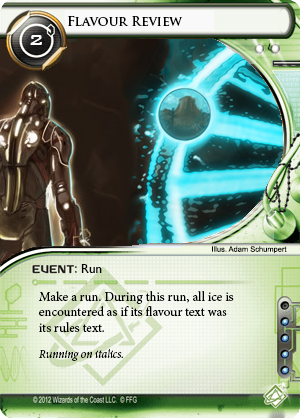 This card assumes much more knowledge of the Runner than we’ve seen previously. Ess: And if that is young Exile on the card art, as some have suggested, that would be a super nifty tie in to his backstory and flavour. Cee: Loses marks for Exile being the runner who is best at pulling stuff out of the heap. Also, his hair is the wrong colour. Ess: It could just be the lighting! Cee: These are mostly all ways of bringing back old hardware or software, possibly reminding yourself of how you pulled off that epic Indexing hack. In any case, so far the runner has been able to interact with their heap because it is, in whatever sense, theirs. How on earth does being on not-officially-existing Blacklist prevent you from interacting with your heap‽ WHAT EVEN IS THE HEAP, ESS? Ess: Yeah, I got nothing for you here. Before Blacklist, we could make sense of the heap as a sort of Schrodinger’s Gun thing, where because you pulled the cards back with Déjà Vu, we can say that these cards only needed a memory trigger to come back. Because you pulled it back with Clone Chip, we can retroactively say that the Runner had backed up that program on this chip. That mucks a bit with the player/runner relationship, in that the player is deliberately choosing to pull back those cards at the time they’re used, but the runner is apparently just preternaturally prepared? But it’s at least … workable. Cee: But now, after Blacklist, all that has to go out the window. What Blacklist implies is that whatever way the Runner has of interacting with their past—if it even is their past!—the Corp’s somehow managed to stop it. And they didn’t even have to do fancy research into the Chronos Project to do it! Ess: I mean, I appreciate the cleanliness of the rules text. Someone over in R&D is justifiably proud of the mechanics of this card. But it is basically a temporary version of the Chronos Project, and bear in mind how much lore went into justifying the Project’s effect. Cee: An entire tour’s worth. Cee: F. F with all the minuses. It just totally breaks whatever understanding we had. Ess: That seems harsh, to me. The card actually works really well, at least if you don’t think too hard about it. And while that’s not good enough for us, I’d say it’s clean enough to not be a hard fail, either. Cee: It is internally consistent, I’ll concede. Fine, D. But I’m not going to be able to let go of my frustration. Ess: So Weyland’s bought up your student loans, and are forcing you onto an aggressive repayment scheme, fine. It doesn’t need a tag on you, so you’re not being targeted specifically; which says there’s a lot of other poor students in your batch who suddenly have the banks shouting angrily at them and don’t know why. Which is all deliciously evil and very Weyland. Cee: But why oh why does it specifically target events that you’ve played before? They can rez Student Loans and you can blithely ignore it, even siphoning them or test running whatever you want… until you want to do it again. The second time, you have to pay two credits to even initiate it? Why. Ess: Furthermore, does every runner have student loans? Iain has student loans? Andromeda? Ess: Gabe paid off his student loans literally decades ago. Cee: Edward Kim? Did Kim even go to college? I thought he was just born with a hammer in his mouth. Ess: Like Career Fair, this is another case of a general effect being handed some extremely specific flavour. And while it works really well when the corp plays it on the identity in this pack, it’s just broken in many many other cases. Cee: And it’s another bizarre heap interaction to boot. Argh. Ess: I think we have to give this a D, for the same reasons we gave Blacklist a D. I was really expecting to be able to love this card, but it’s just as broken. Cee: It’s a real shame cards this mechanically excellent had to break down like this. Ess: “The Big One”. A gigantic earthquake that apparently redefined the west coast of America, opening up the San Andreas fault in the process. Cee: I’m pretty sure a big California earthquake wouldn’t actually do that. The plates are sliding past each other, so while it could “redefine” the coastline, and would definitely cause a lot of property damage, there’s no way the land would actually open up to the sea like that. Ess: I suppose this is modeled more after Hollywood depictions of The San Andreas Earthquake than any actual possibility. Cee: Okay, so we’re assuming significant amounts of flooding, causing wildly fluctuating property values. But all of that happened years ago, so why does this lead to decreased rez costs in the server now? Ess: It could literally just be that it’s cheaper to do business in Breaker Bay. SanSan City Grid has shown us before that server location can also affect other aspects of the projects in the server. Cee: Why would it be cheaper, though? Are we thinking along the lines of the Corps riding the coattails of the government relief effort going to Breaker Bay? Ess: Sure! Kickbacks and subsidies and gratuities, oh my. The benevolent megacorporation riding in to save the day, and coincidentally hoovering up all relevant funding in the process. Christ, one of the cards in this cycle is Corporate Town. Ess: This is why the card is neutral, too; the government can’t be seen to be favouring any one Corp in the area. Everyone gets to nibble at the government pie; just make sure to classify those Eve-bots as morale aids! Cee: The card itself is still not very clear though. We’ve had to come up with this interpretation basically on our own, only really helped by the reference to the disaster. The art or flavour text could have gone a ways further to helping us out here. Ess: At least it isn’t as… nothing as Valley Grid. I’m happy to give this a B-. Cee: It definitely gets docked points for making us search for something that works. We’ve seen examples, in this set no less, of great integration of mechanic, flavour, and art, without the need for us to perform any mental gymnastics. A B- seems fair. Cee: And that’s Breaker Bay! A solid pack, overall. That sense of place we mentioned last time has become ridiculously strong, with every card doing its bit to explain the city of Breaker Bay. We’ve had some rocky patches, sure, with Hayley and the heap, but I’m hard pressed to think of a way they could have made the underlying city feel more real to us. Ess: Hayley and the Heap sounds like a great band. They play recursive electronica, and hit the charts with their first single, “Still Installin’ (From My Clone Chips)”. Ess: But yes, I totally agree. So much of what we’ve seen here is about building out the world, making it broader and bigger. The Pioneer ice. Recruiting Trip. Tyson Observatory and London Library. Study Guide. There are definitely casualties—Andromeda will be heading to many a Career Fair until she rotates out—but being too tightly integrated into story and flavour is a good problem to have! Cee: I just wish Hayley had worked out better. She has something of the Clot problem, in which a lack of flavour is magnified by how often we’re going to see her in play. When I see my opponent, two clicks into their turn, install R&D Interface into another R&D Interface, and then win from Stimhack into Showing Off, I’d like to have some sort of an idea as to what actually just happened. Ess: Yeah. And Blacklist and Student Loans are disappointing even as just a missed opportunity; we could have been sitting here with a better understanding of the heap, not a worse one. Cee: But I’m optimistic, I think, about the rest of the Sansan Cycle. FFG’s convinced me that they’re on an upward trajectory, and I’m looking forward to learning more! Ess: Chrome City is next! Cee, how much do Self-Destruct Chips terrify you? Cee: I’m not even going to dignify your blatant skipping with a response. Cee: ‘Til next time, folks, may all your runs be italicised! flavour review, Fluff and Flavor, Running on Italics.